Why a spa room for rent rather than leasing/opening an entire spa in a retail space? The primary reason is cost! Retail space, no matter where you live, is expensive. Retail space big enough to handle an entire beauty shop, with four or five chairs, with rinsing stations and waiting room . .. we are talking mega-expensive. But we have a better option! We are Salon & Spa Galleria, and our number is (817) 823-7105. Call us if you want your own business in the beauty profession but do not have the funds to lease an entire retail shop. Why rent a beauty salon when one room will do? If you are looking for financial independence, one room will do you quite nicely. Do the math and then set up an appointment to see our salon booth rentals at Salon and Spa Galleria. The math adds up this way: Let’s say you have a good customer list. You open up your own spa room at Salon & Spa Galleria and you take care of ten customers each day in a five day workweek. You make, on average, $75 per customer. That adds up to $750 per week, or $3000 per month. Anyone who has every worked for commissions in a beauty shop owned by someone else will tell you that making $3000 takes several months of hard work. But what about expenses at Salon & Spa Galleria? At Salon & Spa Galleria, your spa room for rent will cost you the weekly or monthly rental fee, in some cases as low as $50 per week. And that is the extent of your overhead at our Galleria Salon & Spa. The only other expenses you will have is the cost of supplies and the cost of products you will sell in your spa. A conservative estimate of your monthly expenses would be about $500-$750 per month, leaving you with between $2500 and $2250 in profit each month. We provide your professional equipment if you need it. We pay the utilities. We provide HDTV, WiFi, and a marketing package. We provide security monitoring, 24/7 access to your suite, and a washer and dryer. And you provide the expertise to make your salon booth rental a success! 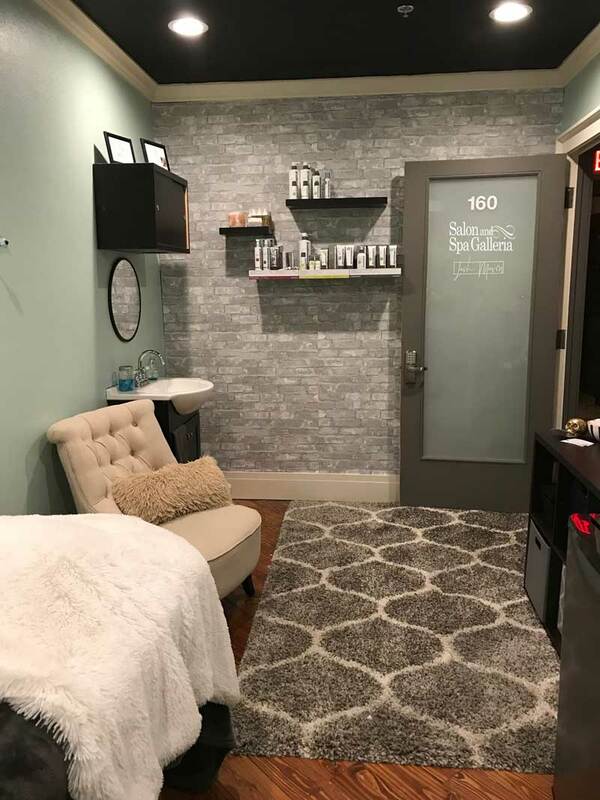 We have a spa room for rent in eleven different locations in the Greater Fort Worth/Tarrant County area, including Fort Worth, Arlington, Mansfield, South Alliance, Grapevine, and Bedford . . . and more are on the way. That kind of expansion can only happen with success, and the business model we present at Salon & Spa Galleria is a business model of proven success. So the only question remaining is this one: WHAT ARE YOU WAITING FOR? One phone call will set up an interview and a tour of our luxury salon suites. There is absolutely no obligation. We want you completely satisfied before you sign on our dotted line. We want you so satisfied that you will be singing our praises for years to come. That way we all come out winners in this deal. The name is Salon & Spa Galleria. The final result is success for you!